How can I find out what shipping fees are? Most orders 15 lbs. and under qualify for our $7.99 flat-rate shipping to the continental US. Some products don't qualify due to weight or special handling instructions. Those items will say so on the product pages. If an ineligible item is added to your cart, your order will be subject to normal shipping rates. We offer $5 flat rate Michigan shipping for all orders 15 lbs. and under. Some products don't qualify due to weight or special handling instructions. Those items will say so on the product pages. If an ineligible item is added to your cart, your order will be subject to normal shipping rates. We offer free in-store pickup for local customers. During checkout, select "In-Store" pickup as your shipping option. You will be notified when your order is ready for pick-up. UPS cannot ship to P.O Boxes. Please do not use a P.O. Box in your shipping address as this may delay your order. If a P.O. Box is used as a shipping address we will contact you to determine alternative shipping methods. We process all orders by the sequence in which they're received. Orders are subject to a 1-2 business day processing time. Most orders placed before 5pm EST will ship the next business day. Shipping can be easily calculated for any in stock item without entering personal or payment information. Simply add the items of interest to your cart, enter your zip code on the Shopping Cart page, and then all available shipping options for the order will be listed. 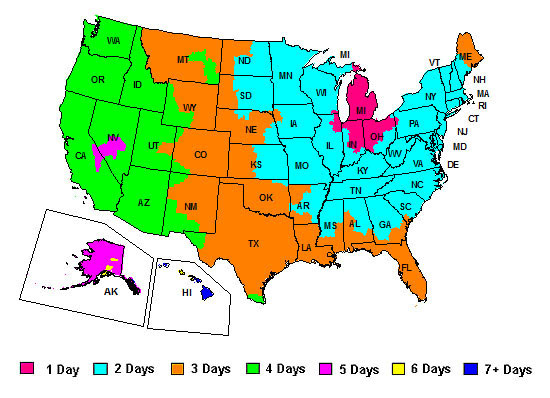 Tracking information is emailed to all customers as soon as their package leaves our shop. Once the tracking number is sent, it may take up to 24 hours for the shipping carrier to update the tracking information. As part of our commitment to the environment, we reuse as many shipping materials as possible and ship products in original boxes when we are able to. This allows us to keep costs down while not creating any more unnecessary waste. If you have any questions regarding a current or future order, please give us a call at 989-486-9265 or send us an email through our Contact Us page. If you are not completely satisfied with your purchase, you may return unused items for an exchange or receive a refund of the purchase price (less shipping) within 30 days of the purchase date, with original receipt. If you receive a damaged item in your original shipment, please notify us immediately. The customer is responsible for return shipping costs unless we have made an error in shipment or an item arrives damaged or defective. In the event of a shipment error or a damaged/defective item, Michigan Brew Supply will be responsible for the cost of ground shipping only, and only for returns made within 30 days of the purchase date.